The debate over whether to raise the minimum wage has expanded in recent years to encompass demands for additional workplace benefits. These include health care, paid sick leave, and most recently the availability of a “fair” schedule. The City of San Francisco was the first to enact legislation on this latter point, enacting the Formula Retail Employee Rights Ordinance on July 3, 2015. San Francisco’s law requires most “chain” stores, as well as their contractors, to provide schedules to employees two weeks in advance, establishes a series of financial penalties for schedule changes that occur less than a week before the scheduled work day, and requires additional work to be offered to part-time staffers before additional employees are hired. Washington, DC, is now considering similar legislation that applies to retailers and chain restaurants in the District. Labor advocates argue that the law is necessary to “[promote] full-time work” at these businesses; in a report supporting their campaign, they argue that these employees “struggle with low wages, too few hours, and fluctuating hours.” Thus far, the research they’ve provided to document this problem comes mostly from data that labor organizers collected themselves. 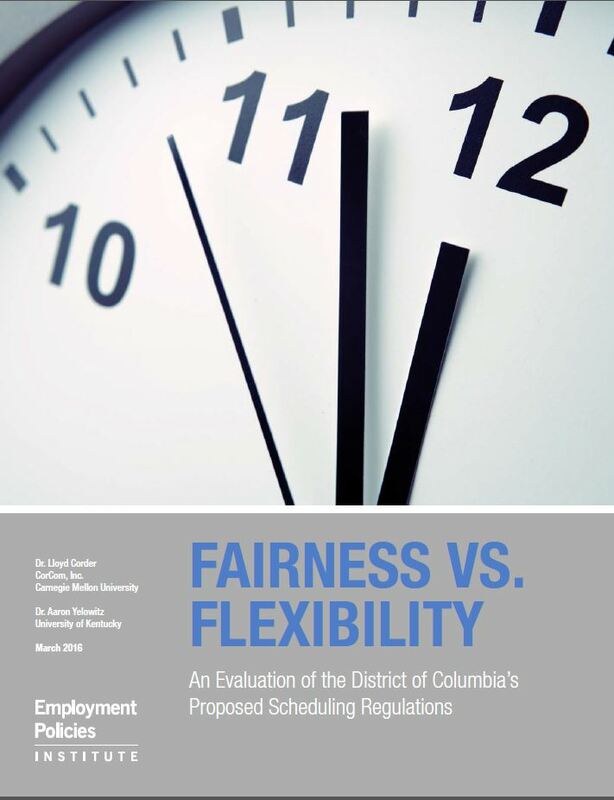 To better understand the impact of the proposed ordinance, this study provides two key pieces of data: A profile of the affected part-time workforce in Washington, DC, and direct feedback from 100 businesses that would be affected by the law. 80 percent have less than a four-year college degree. These data cast doubt on the notion that part-time employees at DC’s retailers and restaurants are being forced to work that schedule; rather, most are voluntarily working part-time. Also important for policymakers to understand is how DC businesses will react to new scheduling mandates. Dr. Lloyd Corder and his survey research team at CorCom designed a survey of 100 restaurant and retail businesses in Washington, DC, that would likely be affected by this law. A majority of businesses say it will be difficult to post employees schedules 21 days in advance of the work week (55%), as the law would require. Even more think the financial penalties will be onerous: For instance, most (71%) say the law’s provision that requires four hours of pay for each change that happens less than 24 hours before the scheduled shift would be extremely difficult to comply with. A majority (59%) agreed that providing employees one hour of pay for each change that happens fewer than 21 days before the scheduled work week would also be extremely difficult to manage and comply with. These consequences—of fewer part-time positions, and of less flexibility in the positions that remain—may be the goal of the law’s proponents, but they appear to be at odds with the preferences of the employees who are voluntarily working those jobs.